Buy Cook N Serve online - TVC Skyshop - Buy world-class innovative products at affordable prices offering full value for money. Now save your time, energy & money with Cook & Serve. Cook delicious food and serve with pride. Cook & Serve is a 16-piece stainless steel cookware, which is a once in a lifetime investment. Aluminium capsulated bottom makes Cook & Serve energy saving, as it cooks faster than other cookware available in the market. Stainless steel kitchen set has transparent glass lid that lets you see and check the cooking status. All the 16 pieces of this stainless steel kitchen set are made from high quality stainless steel and they assure you lifetime freedom from deshaping. The matte finish, mirror polish gives Cook & Serve a beautiful glint that enhances the look of your dining table. Cook n Serve Now save your time, energy & money with Cook & Serve. Cook delicious food and serve with pride. Cook & Serve is a 16-piece stainless steel cookware, which is a once in a lifetime investment. Aluminium capsulated bottom makes Cook & Serve energy saving, as it cooks faster than other cookware available in the market. Stainless steel kitchen set has transparent glass lid that lets you see and check the cooking status. 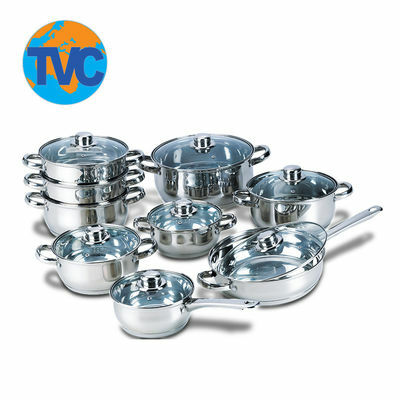 All the 16 pieces of this stainless steel kitchen set are made from high quality stainless steel and they assure you lifetime freedom from deshaping. The matte finish, mirror polish gives Cook & Serve a beautiful glint that enhances the look of your dining table. Warranty: 6 Months.